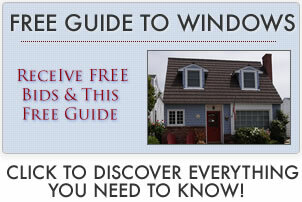 Vinyl windows price can range from $300 to $750, which includes both the cost of the window itself and installation. Pricing will depend on the manufacturer you choose, type of frame, glass package and features, size and the level of difficulty involved with the installation. We have a range of costs for the vinyl windows themselves, as well as installation cost and total pricing. The bottom section details vinyl windows price comparison from past customers. Expect entry level to range from $125 to $250. These are often available at the big home improvement stores like Lowes and Home Depot. Usually they will have the base glass set ups; double paned, perhaps with low-e glass. They will probably by either a fixed frame, horizontal gliding or single hung windows. Standard cost will range from $250 to $350. They will usually be sold from a mid range manufacturer, which there are a handful of good quality companies – see our replacement windows reviews page for more details. The glass package will be mid range and may include several of the following energy efficient features; good U and R values, argon or krypton fills, low-e glass and uv coatings. These windows may be available in different styles, including awning, casements or double hungs. A high end price is around $500 and will probably be offered by a top window manufacturer. The glass package will include good energy efficient features such as – low R and U values, a krypton fill, super spacers and even foam insulation. Consumers can expect high quality hardware and a bigger selection of window types like casement windows or as part of a bay, bow or palladian set up. Window installation cost will run $50 – $250 per window. The following vinyl windows cost are per opening. The following are vinyl windows prices paid by consumers. Use this as a general cost guide only. Also, note that this was the price that the customer paid, not the initial price quoted to them by the company or contractor. The initial price quoted is typically a lot higher — that’s why you need to get multiple quotes and be ready to negotiate. Included install from local company. Included installation from local company. Cost includes installation from local company. Included professional install with a contractor. Included professional install from company. Included professional install by Champion. Cost also included replacing some rotten trims on frames. Dimensions: Varied because of so many types and sizes. Included professional install of 2 picture, 2 storm/thermal frames and replacing rotten trims. Included install from a local company. Included install by local contractor/company.